Principal Cast : Kurt Russell, Wilford Brimley, Keith David, Richard Masur, David Clennon, Donald Moffat, Charles Hallahan, Joel Polis, TK Carter, Richard Dysart. Thomas G Waites, Peter Maloney. Synopsis: A research team in Antarctica finds their isolated base-camp threatened by a shape-shifting alien entity – an entity who wants to take over the world. What we think : The granddaddy of 80’s sci-fi horror, The Thing still brings a chill to your spine thanks to some stunning creature effects, and a Hitchcockian directorial style by John Carpenter. Moody, atmospheric and claustrophobic, the film may show a few of its seams compared to more recent fare of similar ilk, but as a story and with a style years ahead of everyone else, The Thing remains one of the best horror films of all time. 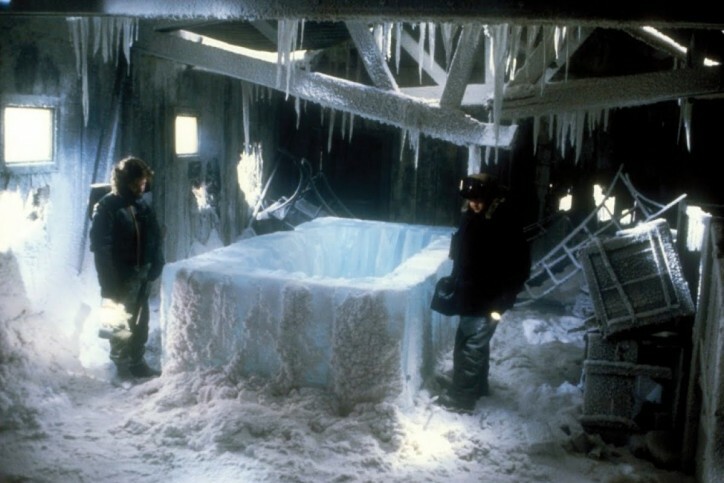 Re-watching The Thing nearly two decades since I first did so, what struck me most about this iconic piece of cinema is just how many other films have cribbed from it ever since. The premise is elegantly simple, the direction utterly superb, and the visual effects still quite shocking, perhaps for the single reason that there’s no CGI to be seen in a second of this movie. 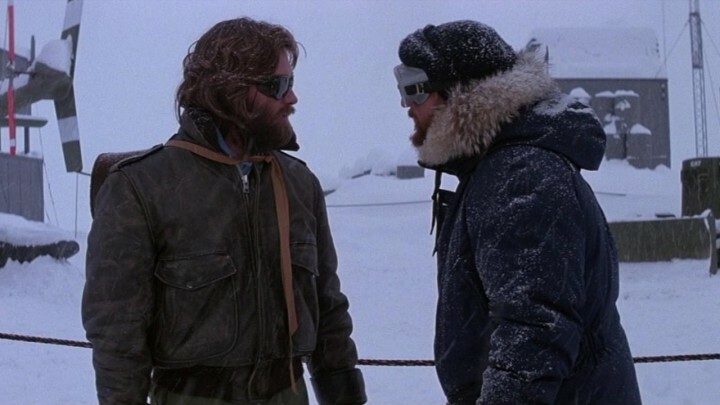 The Thing, which is based on 1938’s Who Goes There – written by John W Campbell – is a piece of pure genre gold, a film unlike any other for its time (even if it’s since been endlessly copied) and one which remains defiant of any modern-eyed expectation. Kurt Russell’s square-jawed leading man performance, coupled with solid work from the eclectic ensemble cast, remain the key element in The Thing that prevents it from feeling contrived or forced; were it not for the cast’s commitment to the work, this movie might have been simply another B-movie experience from the rolling mountains of Hollywood. 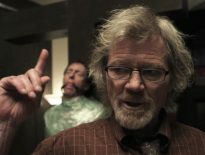 The film cemented John Carpenter’s reputation for solid, dependable film-making in virtually every genre – crime thrillers like Assault On Precinct 13, slasher films like Halloween, action in the form of Escape From New York, and sci-fi fantasy in Starman, formed an initial body of work that would, eventually, diminish as his career progressed into the 90’s and the new millennium. While Carpenter’s work has gone from dependable genre success to mediocrity and the sense he’s “living off his status as a legendary figure in Hollywood”, we revisit The Thing to look back on a director at the very peak of his powers. One day you’re gonna star in a film many consider to be among the worst ever made…. they’re gonna call it…. “Soldier”. An American Antarctic research team finds their base becomes home to an alien entity, an entity which can turn itself into a perfect copy of any other living organism, and an entity which seeks to survive no matter the cost. Chopper pilot MacReady (Kurt Russell), together with the rest of the team, slowly begin to turn on each other as they discover that any one of them could be the creature; its ability to survive is uncanny, since each of its cells seeks refuge within another organism to survive, leaving the team almost no chance of survival once it escapes into their base. As their numbers dwindle, the team devises a test to determine whether each person is truly human, with chilling results. Realizing that the creature will take over the entire world should it make it to civilization, MacReady and the survivors determine that they will fight to the death to ensure that does not happen. 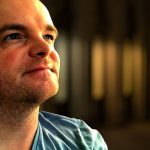 The voices in my head…. they’re telling me….. “stargate”…. If you truly want to terrify an audience, The Thing is the film you should study as the way it’s to be done right. Tense, thrilling, often gory and always exciting, The Thing is not only one of the great genre films of its time, but perhaps ever. As a work of science fiction, or as a horror piece, every segment of this film works like clockwork. From the locale, to the cast, to the production designs and even to the frightening Ennio Morricone score, The Thing is the template for every genre film it inspired since 1982. The very nature of its setting is indeed frightening: the Antarctic may very well be the dark side of the moon for all the warmth and security it offers, as the barren landscape offers both a surreal beauty and an insidious isolation from humanity; a bunch of dudes in parkas start to come unstuck as the seed of doubt is sewn by our alien visitor. 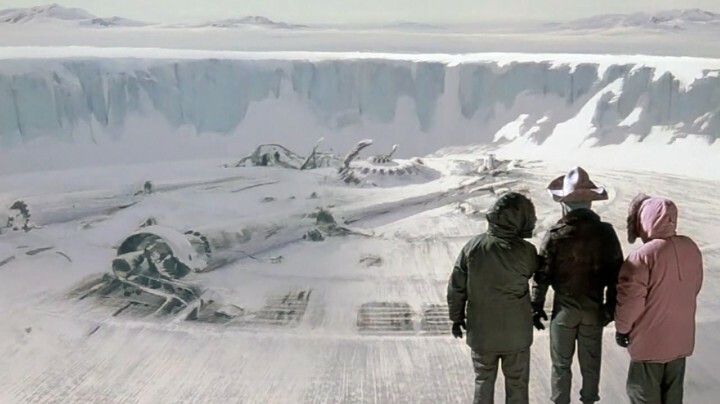 As the drama of the film begins to unfold, and the true motivations for the aliens’ behavior comes to light, the oppressive solitude of the southern icecap invites the audience to understand just how hopeless and how utterly alone these men truly are. They’re days and months from any form of rescue or intervention, so every drop of blood they have is precious life, and to lose it is indeed momentous within the framework of this scenario. I don’t know what you’re thinkin’, man, but me… I’m thinkin’ JACUZZI!!!! Audiences have perhaps become overly familiar with the Isolated Thriller (a term I coined about five minutes ago while constructing the previous paragraph) in years since, but The Thing truly does stand as the progenitor of the modern variant of that idea. A group of humans, isolated from society thanks to work or circumstance (in this instance, both) and without any means of escape without meeting certain death, must encounter an entity of either incredible power or amazing survival skills (again, in this instance, both), overcome their individual fear and their collective terror to either kill or capture said entity to prevent some apocalypse. The group of humans must represent a typically eclectic mix, from medical and scientific personnel, to former military and law enforcement types, down to the radio man and the archetypal “kid” of the group who either bites it early or survives to the end. The technology of the time will be rendered useless, either by weather or human interference, and communication is usually the first thing to go. Weapons may range from hand held gardening tools, such as shovels and trowels, to a complete arsenal of semi-automatic machine-guns and bazookas – or failing that, any kind of explosives – and of course not everyone knows how to use them. There must also be plenty of darkness, plenty of “boo” moments, and of course, the indeterminate flawed nature of the central hero or heroine, all of which plays into audience’s fears about abandonment, isolation and the unknown. By God…. it’s like that movie… you know… ID4, only in reverse…. John Carpenter delivers a solid sci-fi thriller, a precursor perhaps to James Cameron’s Aliens, of which this film has plenty of similarities. 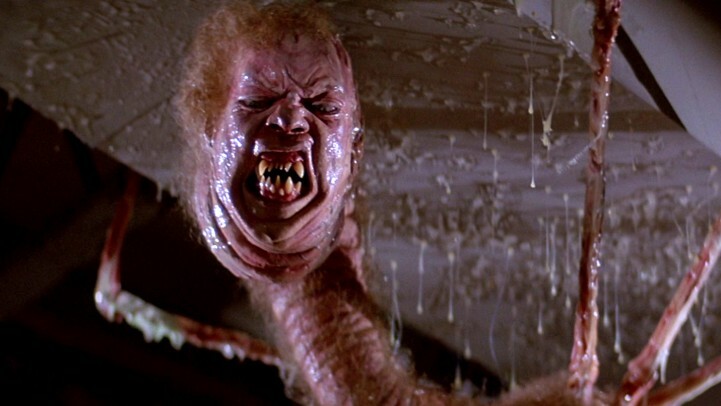 The Thing, which was released in 1982 (Aliens came out in 1986) is minimalist in approach, vectoring the simple story into a razor-sharp human thriller, as Kurt Russell leads a rag-tag team of researchers – people with no real training in survival against an alien who can change into anything – to defend themselves, and in larger ways all of humanity, from this invader. The script, written by Bill Lancaster, wastes no time in setting this story up, with the arrival of an Alaskan Malamute to the research base setting in motion a story of survival against impossible odds. The dialogue sizzles with enormous impact as the cast come to grips with their situation, each one delivering their confusion and profound fear with realism and brevity. 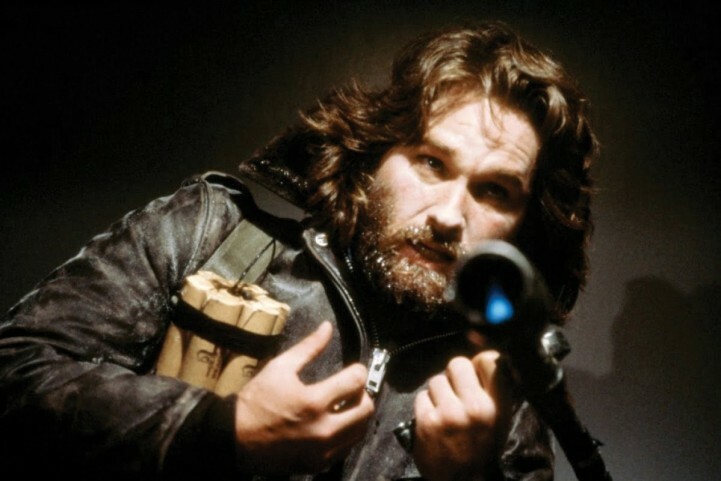 Key to this is the central performance of Kurt Russell, as MacReady, whose screen presence keeps the film from becoming a mess of personalities and conflicts. It is through him that events are recounted, and the audience uses him as the entry point to the conflict within each character; he’s the defacto leader in spirit, if not rank, although midway through he does take charge legitimately with almost no argument. They’d never know just how desperate his headache was…..
Like many films to come after, The Thing does become less about the people and more about “the monster” as the end credits approach, and Carpenter’s able to ratchet up the tension by reducing the character development to zero and building the pressure-cooker of terror to skin-tearing proportions. The creature in The Thing (technically, it’s a multitude of creatures, all taking up residence in various members of the cast) becomes more and more brazen in exposing itself to danger, and although it’s seemingly easy to kill (fire does a pretty decent job), it’s the uncovering who’s really human and who’s not that makes up the bulk of the tension within the story. In an enclosed space like this, with no means of escape, the fear amongst the men is palpable; a key scene, in which several of the survivors use blood samples to determine legitimacy of their humanity, is especially terrifying, because it reduces our characters to petri-dishes of sweat and anticipation – it’s as sweaty-palm a scene as any modern thriller can muster. Carpenter uses the camera with exquisite skill in this film, delivering some remarkably modern shots (modern for even now, some 30 years since cinema release) that echoes a top-tier Hitchcock or early David Fincher. Hello boys! I’m here to parrrrrr-teeeee!!! In any good monster movie, though, the key to selling the story is the quality of your main beasty, and The Thing is no exception. The visual effect work – and by visual I mean “practical, on-set” effects of the creature in its various transitional guises – in this film is astonishingly cool. I’m a big fan of “in camera” effects over digital trickery (although they both have their time and place) and The Thing remains a cinephiles delight of the successful marriage between practical effects and superb editing. The films gore quotient ramps up once the alien starts to inhabit our human cast, with blood and other unknown fluids spraying across the screen as Carpenter amps up the viscera in favor of pure spine-tingling chills. The eerie, not-quite-human deformity that overtakes various cast members during this film still raises those little hairs on the back of your neck, with its vividity and vitality even by comparison to post-millennial film-making techniques. It reminded me of the David Cronenberg visual style a lot, to be honest, although this seemed less introverted and more gut-punch cinema. In other words, the creatures in this film still stand the scrutiny of modern eyes. Big time. You ought to see me play Flight of the Bumblebee with these hands! I remember this film scaring the bejeebers out of me as a kid, way back in the mid 80’s when I first saw it. Truthfully, I actually only remember being scared of it more than I remembered what I was scared of, exactly, but after giving it a watch recently I’m reminded of just why I might have crapped my pants back then. It’s taut, well paced and certainly well filmed – with a pulsing electronica score by Ennio Morricone just to back the visuals up. As a product of the 80’s, it’s definitive. As a cinematic legacy, The Thing remains the archetypal game-changer that reaffirmed what could be achieved with serious horror. As a pure genre film, The Thing is close to – if not at the – top of the pile. Seen this movie? What did you think? Let us know in the comments section below? Want your own review linked here? Also let us know with a link in a comment below. It’s that easy, folks! One of my favourite horror/horror-sci-fi's ever made. It is also my favourite John Carpenter film. I always enjoy seeing the live effects rather than CGI…it just goes to show how effective they were. Yes, it was crude, time consuming and not always very realistic but there's something more fascinating about puppets, make-up and live action effects that CGI doesn't have. Great performances, great story and heart-pounding tension make this one of the best. I agree, Dan. I always prefer practical over digital (although I think the bar has well and truly been set beyond practical nowdays!) and I really appreictaed the subtleties of the production design on this film. The "composite corpse" during the films' opening half is especially well done – I actually believed for a moment that it was exactly what it looked like, I was so taken in by its realism. (3) Believe it or not, the remakquel/prequel wasn't anywhere as bad as it could have been, even if there were a few moments when it was a wee bit derivative and the scenery looked like it was designed for a Play Station III game. Thanks Mark! I'll be seeing the remakquel very soon, so I look forward to seeing if your opinion is the same as my own! Thanks for stopping by! Though I don't recall seeing the original, I was a little less impressed by the "premakquel". St Pauly! Welcome! You should definitely check out the original. Made for real, not with CGI. Thanks for the linkage! Of course I agree that The Thing is one of the best sci-fi horror movies there ever was. I also find it interesting that this film, with its crazy and disgusting gore, is able to transcend the genre film label and be seen by viewers who don't normally watch this kind of stuff. It shows just how well-made this one is, and it's definitely a movie that every film fan should check out. In a toss-up between The Thing and Halloween, I'm edging the latter simply because of the way it spawned an entire genre of filmmaking. The Thing, while iconic in its own right, didn't set a benchmark in the same way. That's not to say it a less important film, but works better as a taut, atmospheric horror film than it does as anything else.